19 years after China banned Falun Gong (July 22, 1999), branding it as a ‘harmful cult that is engaged in anti-government activities,’ the movement is still active in China and around the world. The movement survives in China despite years of violent suppression. Falun Gong followers have long documented the various ways in which followers have been tortured, sometimes illustrating the accounts with re-enacted scenes (clearly labelled as such). What: Billed as an exercise practice, Falun Gong is in essence a quasi-religious movement that engages in occult practices. While the movement and its followers are subjected to religious intolerance and persecution, mainly in China where Falun Gong originated, Falun Gong denies being a religion — even though its teachings has a theological nature. Scholars have described the movement variously as a religion, a new religious movement, a qigong discipline, or a spiritual movement. 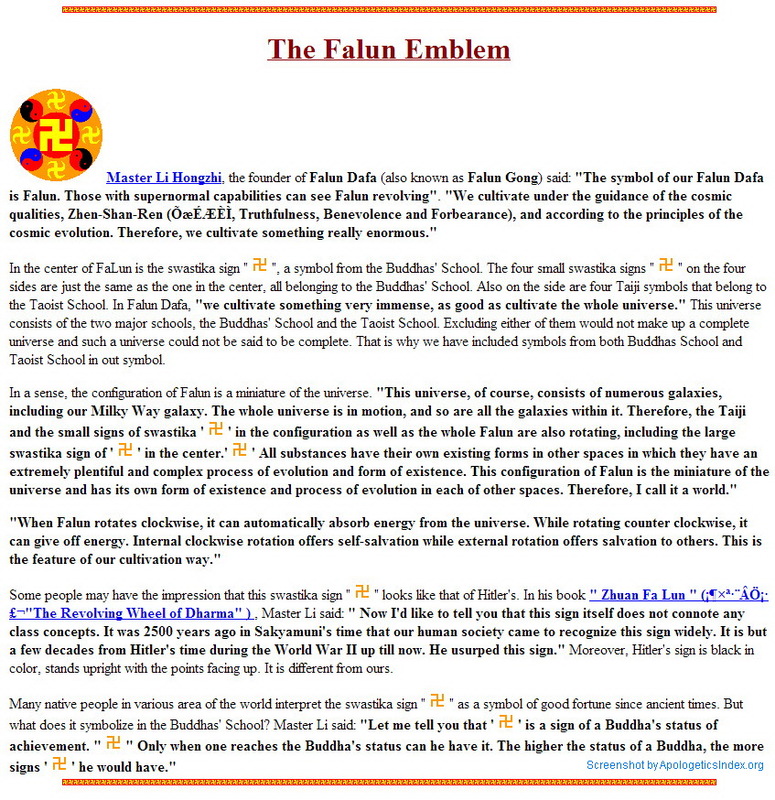 Formal name: Falun Dafa. Falun is the Wheel of the Law (Dharma), in this case referring to the ‘absolute truth’ taught by the Buddha, which inexorably rolls forward. Dafa is ‘The Great Law’. The full term, Falun Dafa, means ‘The Great Law of the Wheel of Dharma’. Note: technically Falun Dafa refers to the teaching, and Falun Gong to the practice, but over the years the terms have become interchangeable. Sometimes the term is written as Falungong. It is a mixture of ancient Chinese exercises, meditation, Eastern religions, and the books and lectures by the movement’s founder and leader, Li Hongzhi. It also includes elements of Confusianism and the New Age movment. In fact, Hongzhi says that those with supernormal capabilities can see Falun revolving. Once a practitioner has obtained the falun in his or her lower abdomen, it will continue to rotate even while the believer is not exercising. According to Falun Dafa, illness and suffering is caused by evil — a result of karmic accumulations obtained throughout previous incarnations, which can be purged by Falun Gong. Followers believe that by practising the movement’s three principles of truth, compassion and forbearance, they will obtain clairvoyance and other supernatural powers. Hongzhi emigrated to the U.S. in 1998, one year before the Chinese government started to arrest and imprison Falun Gong practitioners on the claim that the movement is a harmful cult. Many followers believe Hongzhi is enlightened and the sole possessor of the Buddha’s truth. Adherents: It is impossible to determine how many followers this movement has. Press reports cited by adherents.com give figures ranging anywhere from 70,000,000 in China, to 100,000,000 around the world. Cult-critic Sima Nan, a Chinese version of skeptic James Randi, says Falun Gong is not the most popular of qigong sects. According to him, several other such groups — Zhong Gong, Yuan Ji Gong and Wang Gong — are bigger. Organization: This is a decentralized, informal movement. As a matter of doctrinal significance, Falun Gong is intended to be “formless,” having little to no material or formal organization. Practitioners of Falun Gong cannot collect money or charge fees, conduct healings, or teach or interpret doctrine for others. There are no administrators or officials within the practice, no system of membership, and no churches or physical places of worship. In the absence of membership or initiation rituals, Falun Gong practitioners can be anyone who chooses to identify themselves as such. Students are free to participate in the practice and follow its teachings as much or as little as they like, and practitioners do not instruct others on what to believe or how to behave. Falun Gong is centralized in that spiritual authority is vested in the corpus of teachings of the founder, Li Hongzhi, but organizationally it is decentralized with local branches and assistants afforded no special privileges, authority, or titles. 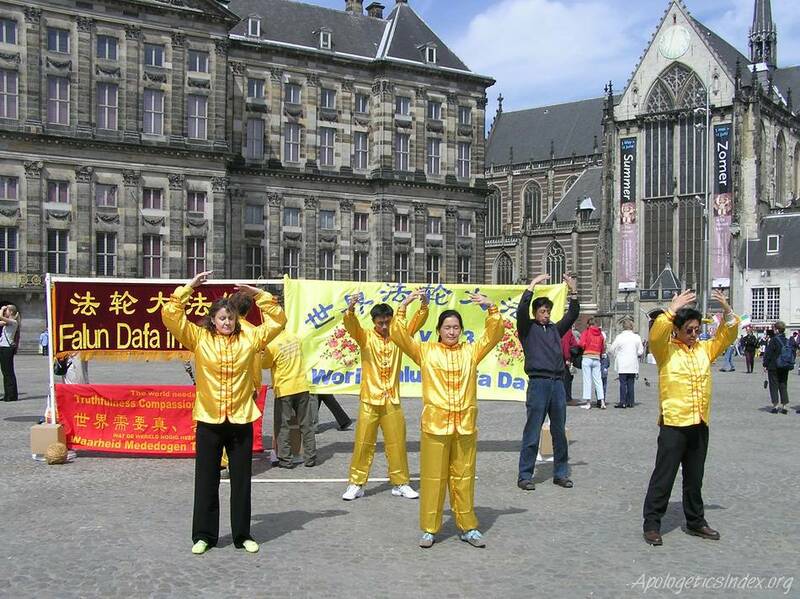 Volunteer “assistants” or “contact persons” do not hold authority over other practitioners, regardless of how long they have practiced Falun Gong. Controversies: Li Hongzhi promotes racism — for instance by claiming that there are different heavens for believers from different races. Hongzhi has told Western reporters that humanity will soon be wiped out, that space aliens are on Earth trying to replace human beings with clones, and that he is invested with supernatural powers allowing him to move through dimensions. Li’s rambling dissertation, Zhuan Falun, has only added to accusations that Falun Gong is a cult. Li writes he can personally heal disease and that his followers can stop speeding cars using the powers of his teachings. He writes that the Falun Gong emblem exists in the bellies of practitioners, who can see through the celestial eyes in their foreheads. Li believes “humankind is degenerating and demons are everywhere” — extraterrestrials are everywhere, too — and that Africa boasts a 2-billion-year-old nuclear reactor. He also says he can fly. On April 25, 1999, the Chinese government was caught off-guard ten-thousand-plus-member sit-in at its government compound in Beijing. 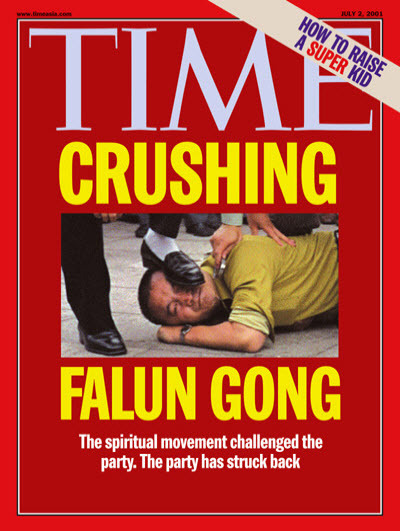 On July 22 that same year the government announced a ban on the practice of Falun Gong, claiming that it is a threat to China’s political order. We should be highly vigilant against superstition for it may confuse our thinking, undermine our fighting will, shake our beliefs and destroy our cohesiveness. Category: Though the Chinese government refers to it as a ‘cult,’ Falun Gong is probably best categorized as a New Religious Movement. Theologically it is not a cult of an existing religion 8, and it doesn’t have clearly defined religious boundaries in terms of a set of doctrines that must be adhered to in order to practice Falun Gong. Note: More research resources will be added soon. [Contra] Christine Dallman, J. Isamu Yamamoto, Christian Research Journal, volume 22, number 02 (1999). Although the statement is intended to reassure Falun Gong practitioners of Master Li’s protection while they practice his prescribed exercises, they reveal two realities about Li and his spiritual disciplines. First, contact with spirit beings (i.e., demons) is a real possibility when one engages in Li’s exercises. Second, from the Christian perspective it is clear that Li himself has some connection with the domain of darkness. If North Americans in general should be distressed with Li’s teachings, Christians should be even more disturbed with the occult nature of his exercises. What is the Falun Gong? And why does the Chinese government want to destroy it? Todd Hertz, Christianity Today, Feb. 1, 2002. Beneath Li’s superficial teachings of “truthfulness, compassion and forbearance” are teachings that are intolerant of dissent and homophobic, that discourages sick people from seeking needed medical treatment and that manipulate followers to blindly follow Li’s absolute authority. Unfortunately while the media has focused only on the human rights issues in China, it has failed to educate Americans about how deceptive and harmful the Falun Gong can be in our own country. At Religion News Blog you can find Falun Gong news via its topic, its tag, or the Google-powered search engine. Older news items, dating before February, 2002, can be found here. China.org [Contra] The China Internet Information Center, where you “get news and read Chinese government white papers, including ones on human rights, Tibet, and arms controls and disarmament. Also includes propaganda regarding Falun Gong. Expose the Fallacies of Falun Gong [Contra] One of several sites sponsored by the Chinese government. Part of a widespread information campaign against the movement. Facts [Contra] This website, which looks a lot like that of the Falun Dafa Information Center (see below), is operated by Chinese authorities. Falun Dafa [Official] Official website. Best source to learn about the movement’s teachings. Minghui.org [Official] One of several primary Falun Gong websites. Minghui is an all-volunteer organization that operates Minghui.org, a website dedicated to reporting on the Falun Gong community worldwide. The focus of Minghui is reports from China. Minghui also serves as a central communication hub for Falun Gong practitioners around the world to share insights and ideas, expose the persecution faced inside China, and comment on its ramifications. It is the primary site read by Falun Gong practitioners. It is also watched closely by China’s regime officials. © Copyright 2013+, Apologetics Index. All rights reserved. Links to this page are encouraged. Do not repost or republish without permission. This page is written and maintained by Anton Hein, founder and team member of Apologetics Index. He lives and works in Amsterdam, Netherlands, with his wife, Janet. They are involved in helping people leave cults, abusive churches or abusive relationships. Anton’s interests vary from Christian apologetics to street photography. He’s a coffee connoisseur who grinds his favorite coffees with an antique, cast-iron #3 Spong for use in either a stove-top Bialetti, a french press, or the Aeropress.